Ford is scared of the future. It has to figure out how to survive in a time when manually driving your car to work is as archaic as commuting by horse. The motor company is running research projects to look at how the future might be multi-modal, with car-share schemes, folding electric bikes, and self-driving cars. There is a deep recognition of how much of a part IT plays in this, and the chosen company to help Ford with understanding IT is HP. It's a bit of a love-in, as Ford buys lots of HP kit and HP sales staff drive round in lots of Ford cars. The rush to IT to save the company is akin to the work Xerox did when it became scared of the paperless office and set up PARC, which developed the graphical user interface that formed the basis of the desktop operating systems we use today. There are echoes of the PARC spirit everywhere. You can feel the results of the meetings where the car company said "nothing is sacred." 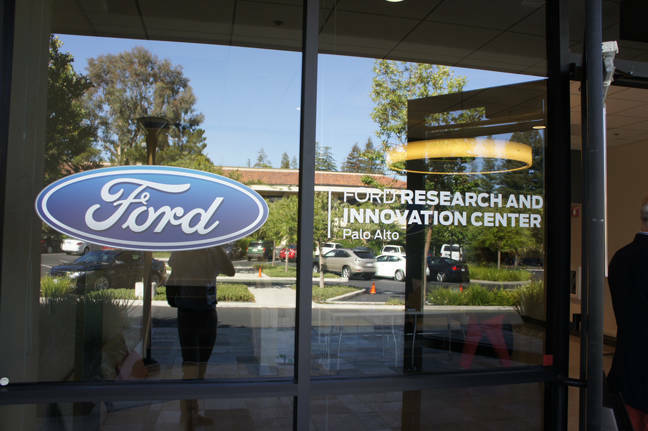 Just as Xerox did, Ford has set up its own research center in Palo Alto, California, looking at future technologies, such as 3D printing with a view to mass as opposed to future manufacture. One of the ideas the company is looking at is using cars driving down the street to map where the empty spaces are, compiling a database and sharing that with other (Ford) drivers who might want to park in them. The space spotting uses the conventional ultrasonic parking sensors on the car, but instead of being switched off while the car is driving along, they are echo-sensing the side of the road and comparing it to a map. Ford claims that 30 percent of LA emissions are related to hunting for parking. Only 12 per cent of parkers find a spot straight away and the rest might take up to 25 minutes. Indeed Ford is very interested in parking, and has segmented the types of parker with the names Rounder Ralf, Wealthy Wander, The Adventurer, and People Pursuer, for those who go around the same loop again and again, those who look for spaces aimlessly, those who go off in search of back streets, and those who follow individuals carrying shopping bags back to their cars. Ford also sees an application for a remotely driven car. You could drive to where you want to go, get out, and then hand control over to a call center that would drive the car off, using cameras and sensors in the car to see where it was going and remotely piloting the car. It could then be taken to a distant parking lot to be summoned back when needed.